Norwegians celebrate their National day in a very different manner and here are some warnings! 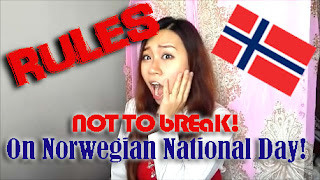 If ur new to Norway, here's some tips on What Not to do on the Norwegian National Day!! Do remember it's the Norwegian National day Not your country National day so do respect and embrace the Norwegian culture during this big happy celebration day! If you are a Norwegian, do let me know if i have missed out anything !